David is standing in the middle of more than 300 tons of gold and 638 tons of silver along with 675 tons of bronze and he praises the Lord saying ‘It all yours’! This is one of my favorite passages as it relates to our money and our ‘stuff’. It’s all yours, dear Father. Yours is the greatness, the power, the glory, the victory and the majesty. Everything in the heavens and on earth is yours. Wealth and honor come from you alone for you rule over everything. Power and might are in your hand and you decide who is made great and given strength. 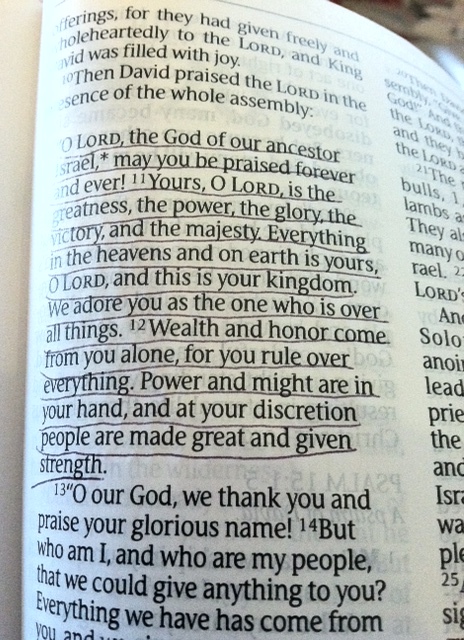 David goes on to say how we can’t really give God anything because it’s all his. Everything we have comes from him. We give back to him in gratitude for what he has already given us. Our days on earth are like a passing shadow, gone soon without a trace. But you, dear God, give us significance. You call us your sons and daughters and you delight in us. We join David today as we praise you and thank you, dear God!